being MVP: Veestro Vegan Meals & Giveaway! Veestro Vegan Meals & Giveaway! 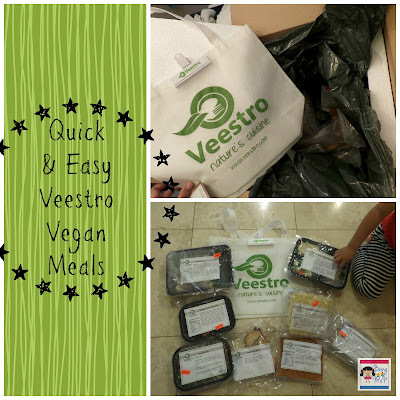 I am trying to eat healthier but am fond of quick and easy meals, especially at work so I was delighted to receive an assortment of meals from Veestro for review. I was pleasantly surprised at the delivery packaging as the meals arrived in an insulated shipping container which kept them frozen until I got home from a long day at work. I immediately tore into the box to see what goodies were inside. 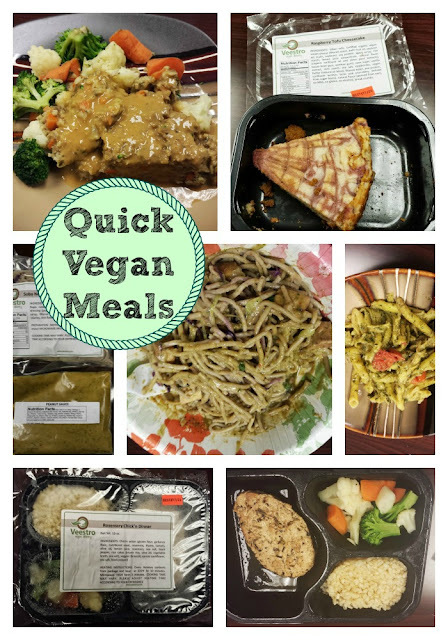 My box included the following: Lentil Meatloaf, Raspberry Tofu Cheesecake, Penne Pesto, Raisin Nut Cookies, Tortilla Soup, Linguini Bolognese, Soba Noodles with Peanut Sauce and Rosemary Chick'n Dinner. The preparation instructions are on the label of each meal and it was so easy to pop most of the meals in the microwave at work. "Veestro products can be microwaved, boiled or thawed in their original packaging. The meals arrive fully cooked; preparation is simple, easy, and quick!" The wonderful smell wafted through the kitchen and people inquired as to whose meal smelled tasty. I, of course, stated that these were Vegan microwavable meals from Veestro. I really enjoyed the noodles as well as the Chick'n. Although I'm not Vegan, I try to have a vegetarian meal at least once a week to try to be a wee bit healthier. The desserts were not my favorite but maybe I'm addicted to sugar too much. They didn't have much flavor. The tortilla soup gets a high give - full of flavor and chunks of veggies plus it's easy to heat up in the microwave at work! Veestro also has a gluten free menu that looks tasty as well as kids and family meal options. The Portobello Steak dinner looks tasty! These nutritious meals from Veestro are great when you don't want to spend time in preparation yet want something healthy and affordable to eat. They are perfect to stash in your work freezer for when you are too busy to take a lunch as well as at your home when the spouse who cooks (Hubs) is away on a business trip. Make sure to connect with Veestro on Facebook and Twitter! One Winner will Receive a Sampler Pack! I want to try the Raisin Nut Cookies! I would love to try the gluten free feast. Since I have to be gluten free, And you get to try a little of everything. Especially Cheesecake, I don't remember the last time I had that. YUM! The Mediterranean Skillet sounds delicious! I would love to try Quinoa Soup! I live gluten and dairy free and eat a lot of quinoa. it would be nice to have it a new way. the pizza napolitana looks great! i love love love tempeh....i'd like to try the Pan Seared Cajun Tempeh Dinner! would love to try The "Incredible Hulk"
The incredible hulk sounds interesting! I would love to try the Raspberry Tofu Cheezcake. I want to try the Raisin Nut Cookies! Thanks so much for the fantastic giveaway! The Pan Seared Cajun Tempeh Dinner looks yummy! Thanks! I'd love to try the oatmeal chocolate chip cookies! I would love the The "Low-Cal Plan". The Veggie Lasagna (Family)looks delicious...oh and the "Power of the Tropics" drink too! I would love to try the Mediterranean Skillet. This is amazing! I am vegan and would LOVE to have the food delivered to me! I think the Soba Noodles With Peanut Sauce looks awesome, as well as Chocolate Chip Peanut Butter Cake for desert! I want to be more of a raw vegan, but I would love to have my mom try some vegan meals so she can understand that being vegan isn't about restriction and starving. I would think she would like to try any of the cookies, especially the oatmeal chocolate chip cookies. The lentil loaf, Cajun tempeh and veggie empanadas all look yummy! Everything looks delicious! The lentil meatloaf might be the one I would try first. The Raspberry Tofu Cheesecake sounds great! The Cajun Tempe is something I'd love to try too. I want to try the peanut sauce! I'd love to try the Lentil Meatloaf! Red Curry with Tofu and Vegetables sounds superyumful! The Enchilada Casserole looks amazing! I want to try it all!!! They are total opposites but I'm very intrigued by both the Mac N Cheez and the Green Juices they offer! I'd love to try the Mac N' Cheez, just to see if it's any good. I have yet to find a Mac N' Cheez that tastes good to me. I want to try the Butternut Squash Bisque. I would like to try the enchilada casserole! I've never tried vegan cheesecake before...the marbled cheezcake sounds good! the enchilada casserole sounds delicious!! love that this company is out there- everything sounds amazing! thanks so much for the giveaway! I would love to try their Red Curry with Tofu and Vegetables! I'd love to try the Portobello Steak Dinner! All of the dishes sound delicious, but the Red Curry with Tofu and Vegetables really caught my eye. I'd like to try the Veggie Lasagna. The Enchilada Casserole looked good. I would like to try the Mac N' Cheez.